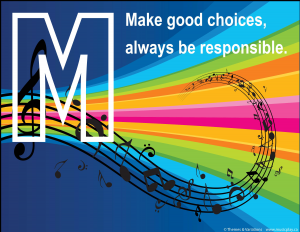 Musicplay K-5 Synopsis – What Does Musicplay Teach? I had an email question from a teacher this week. She needed to give a synopsis of what she teaches in each grade to her principal. She asked if I had a synopsis of what’s taught in Musicplay, and I had never written it in this format. So here’s the synopsis. Of course how much you’re able to teach depends on the time allotted for music, the experiences your students come with, and a myriad of other factors. With Musicplay you treat the teacher’s guide like a menu – choose the song, choose the activities. If you do all the “core” activities, you will complete what’s in the synopsis with your students. In kindergarten music classes students will learn poems and songs from many different styles and cultures in English, Spanish, French and other languages. They’ll learn seasonal songs, songs to enhance the themes in their classroom, and will learn songs that reinforce basic skills that they learn in kindergarten such as colors, numbers, shapes, and alphabet. They’ll sing and play many action songs and singing games. They’ll practice keeping a steady beat using non-locomotor and locomotor movement with body percussion and with instruments. Students will begin to read rhythms that are one, two or no sounds on a beat. Students will accompany simple songs with borduns on barred instruments, and will use non-pitched rhythm instruments to create accompaniments for poems, songs and stories. Students will create and play new verses, new rhythm compositions and B sections. They will learn about form in music by moving, listening and creating new compositions. Students will listen and move to the beat of the teacher’s drum, and will listen and respond to the music of Bach, Handel and other classical composers. Students will learn to identify high-low, loud-quiet, fast-slow, in sounds around us, through movement and through listening. Students will identify timbre such as speaking voice, singing voice and classroom instruments. In Grade 1 music classes students will learn poems and songs from many different styles and cultures in English, Spanish, French and other languages. They’ll learn seasonal songs, songs to enhance the themes in their classroom, and will learn songs that reinforce basic skills that they learn in Grade 1 such as beginning consonents and vowels. They’ll sing and play many action songs and singing games. They will sing simple songs in two parts by adding melodic or rhythmic ostinato. They’ll practice keeping a steady beat using non-locomotor and locomotor movement and using body percussion and instruments. Students will learn to read rhythms that include quarter notes, pairs of eighth notes, quarter rest. They will read simple melodies using the solfa syllables so, mi, la and do. Students will accompany reading songs with simple Orff arrangements, and will use non-pitched rhythm instruments to create accompaniments for poems, songs and stories. Students will create and play new verses, new rhythm compositions and B sections. They will learn about form in music by moving, listening and creating new compositions. Students will listen, move, respond and begin to use critical analysis when listening to the music of Bach, Handel and other classical composers. Students will identify loud-quiet as forte and piano, fast-slow as allegro and largo. Students will identify music that is smooth sounding and music that sounds separated. Students will identify timbres such as speaking voice, singing voice and classroom instruments. Students will use a variety of expression when they sing and speak to show that they understand the meaning of the text. In Grade 2 music classes students will learn poems and songs from many different styles and cultures in English, Spanish, French and other languages. They’ll learn seasonal songs and songs to enhance the themes in their classroom. They’ll sing and play many action songs and singing games. Students will learn a few simple rounds. They will sing simple songs in two parts by adding melodic or rhythmic ostinato. They’ll practice keeping a steady beat using non-locomotor and locomotor movement and using body percussion and with instruments. Students will read rhythms that include quarter notes, pairs of eighth notes, quarter rest, half and whole notes and rests. They will learn to read tied quarter notes. They will identify accented beats, and tell how many beats are in each group. (time signature) They will read simple melodies using the solfa syllables do, re, mi, so and la. Students will accompany songs with Orff arrangements, and will use non-pitched rhythm instruments to create accompaniments for poems, songs and stories. Students will create and play new verses, new rhythm compositions and B sections. They will learn about form in music by moving, listening and creating new compositions. They will define rondo form and AB form. Students will listen, move, respond and begin to use critical analysis skills when listening to the music of Bach, Handel and other classical composers. Students will identify a variety of dynamics and tempos using musical terminology. Students will identify articulation in music. Students will identify timbres such as speaking voice, singing voice, families of classroom instruments and families of orchestral instruments. Students will use a variety of expression when they sing and speak to show that they understand the meaning of the text. In Grade 3 music classes students will learn poems and songs from many different styles and cultures in English, Spanish, French and other languages. They’ll learn seasonal songs from many cultures. They’ll sing and play many action songs and singing games. Students will sing songs with ostinato, many rounds and begin singing partner songs. They’ll practice keeping a steady beat using non-locomotor and locomotor movement and keeping a beat with body percussion and instruments. Students will read rhythms that include quarter notes, pairs of eighth notes, quarter rest, half, whole notes, groups of four sixteenth and the corresponding rests. They will identify accented beats, and will read music in 2/4, 4/4 and 3/4 time signatures, explaining that the music is in groups of 2, 3, or 4. They will read simple melodies using the solfa syllables do, re, mi, so, la, high do, low la and low so. Students will accompany many songs with Orff arrangements, and will use non-pitched rhythm instruments to create accompaniments for poems, songs and stories. Students will create and play new verses, new rhythm compositions and B sections. They will learn about form in music by moving, listening and creating new compositions. They will identify and define rondo form, ABA form and theme and variations. Students will listen, move, respond to and use critical analysis skills when listening to the music of classical composers from the Baroque, Classical, Romantic and Modern eras. Students will identify dynamics, tempo and articulation (stacatto, legato) using musical terminology. Students will identify the timbres of classroom instruments and orchestral instruments and be able to classify/sort them into families. Students will use a variety of expression when they sing and speak to show that they understand the meaning of the text. In grade 3 students may learn to read absolute note names (ABCDEFG) and play songs using BAG E on the recorder. In Grade 4 music classes students will learn poems and songs from many different styles and cultures in English, Spanish, French and other languages. They’ll learn seasonal songs from many cultures. They’ll sing and play many action songs and singing games. Students will sing songs with ostinato, many rounds, partner songs and two-part songs. They’ll practice keeping a steady beat using non-locomotor and locomotor movement and keeping a beat with body percussion, instruments and cups. Students will read rhythms that include quarter notes, pairs of eighth notes, quarter rest, half, dotted half, whole notes, groups of four sixteenth, eighth-sixteenth note combinations, syncopated notes and the corresponding rests. They will identify accented beats, and will read music in 2/4, 4/4 and 3/4 time signatures, explaining that the music is in groups of 2, 3, or 4. They will read simple melodies using the solfa syllables do, re, mi, fa, so, la, ti, high do, low la and low so. Students will learn to read absolute letter names – ABCDEFG. Students will accompany many songs with Orff arrangements, and will use non-pitched rhythm instruments to create accompaniments for poems, songs and stories. Students will create and play new verses, new rhythm compositions and B sections. They will learn about form in music by moving, listening and creating new compositions. They will identify and define rondo form, AB, ABA form and theme and variations. Students will listen, move, respond to and use critical analysis skills when listening to the music of classical composers from the Baroque, Classical, Romantic and Modern eras. Students will identify dynamics, tempo and articulation (stacatto, legato) using musical terminology. Students will identify the timbres of classroom instruments and orchestral instruments and be able to classify/sort them into families. Students will use a variety of expression when they sing and speak to show that they understand the meaning of the text. In Grade 4 students will learn to play songs that may use BAG ED C’D’ F on the recorder. They will create their own recorder compositions using BAG E (D). Students may learn to accompany one and two chord songs with the ukulele. In Grade 5 music classes students will learn poems and songs from many different styles and cultures in English, Spanish, French and other languages. They’ll learn seasonal songs from many cultures. They’ll sing and play many action songs and singing games. They’ll practice keeping a steady beat using non-locomotor and locomotor movement and keeping a beat with body percussion, instruments and cup games. Students will read rhythms that include quarter notes, pairs of eighth notes, quarter rest, half, dotted half, whole notes, groups of four sixteenth, eighth-sixteenth note combinations, syncopated notes and the corresponding rests. They will identify accented beats, and will read music in 2/4, 3/4, 4/4 and 5/4 time signatures, explaining that the music is in groups of 2, 3, 4 or 5. They will read simple melodies using the solfa syllables do, re, mi, fa, so, la, ti, high do, low so, la, and ti. Students will learn to read absolute letter names – ABCDEFG. Students will accompany many songs with more complex Orff arrangements, and will use non-pitched rhythm instruments to create accompaniments for poems, songs and stories. Students will create and play new verses, new rhythm compositions and B sections. They will learn about form in music by moving, listening and creating new compositions. They will identify and define rondo form, ABA form and theme and variations. Students will listen, move, respond to and use critical analysis skills when listening to the music of classical composers from the Baroque, Classical, Romantic and Modern eras. Students will identify dynamics, tempo and articulation (stacatto, legato) using musical terminology. Students will identify the timbres of classroom instruments and orchestral instruments and be able to classify/sort them into families. Students will use a variety of expression when they sing and speak to show that they understand the meaning of the text. In Grade 5 students will learn to play songs that may use BAG ED C’D’ F on the recorder. They will create their own recorder compositions using BAG E (D). Students may learn to accompany one, two and three chord songs with the ukulele or the guitar. Try www.musicplayonline.com for free for a month! This is an amazing online resource! Just $149.95/year USD! This entry was posted in Assessment, Curriculum, Lesson Plans, Teaching Tips and tagged Denise Gagne, music curriculum, music lesson plans, music year plans, Musicplay, Musicplay outline, Musicplay synopsis on March 31, 2017 by Denise Gagne. Is Teaching Harder Now than it was 40 Years Ago? Is Teaching Harder Now than 40 years ago? When I’m in schools teaching now, I often say how much harder teaching is today than it was when I started in 1978 – almost 40 years ago. The children have shorter attention spans (no attention spans), behaviors are worse and consequences non-existent, parents blame the teacher for everything that goes wrong with their kids, and teachers have hours of paperwork that didn’t exist 40 years ago. But is it really so much worse teaching today than it was in 1978? The work day 40 years ago started early with bus duty. Every teacher had to supervise bus duty and recess and lunch hour at least once a week, and in smaller schools a lot more often. That included being outside when it was -40 (-40 is the same in F and C) in the schools in Saskatchewan where I started my career. The idea that teachers should get a 30 minute lunch break wasn’t in effect in 1978. I had choir twice a week at lunch for many, many years, so I’d have 10-15 minutes to eat something, before meeting with the choir. There were a lot fewer prep periods as well. I was really lucky if I had 2 preps in a week, and some years there were none. Staff meetings were held once a month after school, and could go hours if something difficult was up for discussion. When I moved to Red Deer in 1992, staff meetings were held once a week, before school, so once a week you had to come to school by 7:30 for the meeting. There were no personal days in 1978 or days in lieu. We had parent-teacher conferences in the evenings, and you had to be there. There were no days off because we’d given up our evening to be there. If you needed a medical appointment, you were expected to schedule it after school hours if at all possible. Stress leave was virtually non-existent. If you needed a stress leave, you were told that you probably weren’t suited to the job, and it was suggested that you resign. The teaching year was 200 days, and a few were set aside for professional development, teacher planning at the beginning or end of the year. Compare that to 2017 when students are dismissed early once a week for staff meetings/PD. In some places prep periods are part of the teaching contract. And in many schools, paid lunchroom supervisors do the lunchroom duty. Many (most) districts have some personal days that teachers can use whenever they want for whatever they want. Technology – A Blessing or a Curse? In 1978 we had filmstrip projectors, record players, and 8mm movie projectors. Record players let you select the track you wanted, but of course they were big and bulky to store. If you had a bouncy floor, when you did folk dancing to the records, sometimes the movement was enough to make a record skip. When cassette tapes became available, they were easier to play, but then you had to fast-forward or rewind to find the song that you wanted to play. Copying a record was impossible for the average person, but with cassette tapes, it was easy to make copies of songs you wanted. You could even tape songs from the radio. The filmstrip projectors weren’t too complicated to use. We could buy the filmstrips if we had a big budget, but more often, borrowed them from a central library, so you had to plan ahead if you were going to use one. Setting up the movie projectors was a lot more complicated. Sometimes the school librarian (yes, we had librarians then) would set it up for you, but this was never a simple process. When you finally got it going, even if it wasn’t such a great film, it would keep the kids attention, just because they didn’t see them all that often. In 1978 if I wanted to copy a worksheet for students I had 2 choices: Ditto or Gestetner. The Ditto stencils, you’d have to type out (don’t make a mistake or you have to either scrape it off or start over), then go to a machine, attach the stencil part and crank the handle to make your copies. https://www.youtube.com/watch?v=B979xBnk2Hg. This video shows a fancier machine than our school had – you didn’t have to crank it, but this is the general idea. In 2017 if I want a worksheet, I can often find one to download and make photocopies – much less time to make 30 worksheets than it was in 1978. What can end up taking the time in 2017 is the “finding” of the worksheet. Instead of making your own, you can hunt through bizillion worksheets on pinterest or TPT eating up the time you save in the copying. In 1978 if you wanted to research and create a unit on a composer you could go to encyclopedias or take books out of the library. If your library was really limited, you could request books through inter-library loans, and wait a week or 10 days until your requested book arrived. You’d have to buy recordings (records) of the works that you’d want to study. There were very few 8mm movies of live performances for your students to view. You had pictures or posters of the musical instruments, but movies demonstrating the instruments were hard to find, and if you could find them, they were expensive to purchase.. Developing a new unit of study, could take you weeks of work. In 2017 you’ve got Google, YouTube, Wikipedia – and countless websites with information. Any information you might need is all available through a phone in your pocket. You’ve got millions of live performances on YouTube of almost any musical work that you’d like to study. Creating a unit of study should be faster and easier than ever before. You don’t need to purchase recordings any more – you can find almost any recording you want on YouTube or you use a streaming service like iTunes or Spotify. Does this make your job easier? It should, but too much information can give you so many choices that creating a unit can take just as many hours as it did in 1978. The instant delivery of information via Google and YouTube has been a blessing in so many ways. But it’s also created a generation of children who have little or no patience or perserverance. These kids want instant results – from everything from looking up song information to learning to play a recorder. Everything else is instant – why can’t I play a C scale instantly on my recorder? Attention Deficit Disorder wasn’t a disorder in 1978. In 2017 it’s an epidemic, in large part because children are growing up with everything they want being available instantly. If I want to watch a favorite TV show I don’t have to wait until Thursday at 7:30 PM – I can watch it now on Netflix or YouTube. If I want a toy that I see online, I can order it from Amazon and a day later it’s delivered to my house. If I want a new game, I can download it from the app store and play it right away. Video games deliver instant gratification – even to our toddlers. There are really great apps that teach toddlers important skills. Endless Alphabet is an incredibly good app that I’ve downloaded for my 2-3 year old grandkids. They drag a letter to a word and when they’ve got them all in place, they get to watch a really cute video that explains the meaning of the word. If that isn’t enough “reward” for getting the letters in place, the kids can touch areas of the final screen and fireworks go off. It’s a really good tool, but there is lots of “rewards” built in to keep the kids interested. When these same kids come to our music classes, they’re used to this kind of learning environment and anything less isn’t as engaging. We still have kids in our classes who are amazing students with great focus and attention. But the numbers of kids who need to take “brain breaks” or use fidget devices are growing exponentially. Many classes have children who have been diagnosed with anxiety or stress disorders. Showing fast paced cartoons to teach concepts just feeds the addiction. Giving them authentic musical experiences where they experience the concepts weans them off the necessity for a screen “reward” and they’ll internalize the experience. For example – Singing a song with cute little cartoon images about beat may keep the students engaged. But singing an authentic children’s song, stepping the beat/clapping the words or rhythm, and then playing Beat/Rhythm Switch game (switching between beat and rhythm) is an engaging activity, and the children are learning by doing – not by watching a screen. Yes, we need to label and define concepts, but the actual learning is best accomplished by students experiencing beat/rhythm, fast/slow, high/low, loud/quiet. In the www.musicplayonline.com resources every time I create an interactive activity, I’m thinking about ways that the teacher/students can use the activity without feeding their screen addiction, and ways to ensure that the students have an authentic musical experience. In many ways, the concept slides and interactive activities teaching beat/rhythm at www.musicplayonline.com are just reminders to the teacher of the authentic process that we should be doing to fully involve the children. In 1978 there were few special needs students in our classes. We had a range of abilities, but there were very few kids with severe physical or developmental abilities, and way fewer kids with emotional difficulties. Having a teacher assistant come to music classes was rare. The 2017 teacher has to be able to differentiate instruction for a huge range of children. One third of some classes might have IPPs requiring you by law to differentiate. Many classes come with a TA, and some of them are wonderful and some need teacher direction to be more effective in helping the students they are assisting. So in 2017, you don’t write just one lesson plan – sometimes you have several for just one class. Writing report cards in 1978 was fairly simple – you gave an A, B, C or D and maybe a generic comment. “Student A” participates well in music class. or “Student B does not participate appropriately in all activities.” If parents came in for interviews, and they were the parent of Student B, they would usually ask what they could do to improve Student Bs behavior in class. In 2017, A, B, C, D are rare, and more often you see descriptors like “Exceeding expectations”, “Meeting expectations,” and “Beginning to Meet expectations.” Some schools require personalized comments for every student. For teachers who teach 1000 students, this is a tough expectation to meet. Children were not angels in 1978. I had a fist fight in my Grade 5 band class during my first year of teaching in 1978. The response to discipline infractions was usually a trip to the principal’s office. For a minor infraction a student might get a detention. For a serious infraction an out of school suspension. Back in 1978, schools could still use the strap, although it was rarely used. I don’t remember a student ever getting the strap in the schools that I taught in. If a parent got a note from a teacher telling them about a discipline problem, there was usually consequences at home. My husband talks about how if a kid got the strap at school, they probably got it at home too. Was this a good thing – of course not. Hitting a child to teach them not to hit, makes no sense and could easily lead to abusive situations. In 2017 the pendulum has swung far in the other direction. Corporal punishment is outlawed – and rightly so. We have reflections that children fill out, and they may have an in-school or out -of-school suspension for serious infractions. There are a myriad of discipline models in schools. I truly hate the discipline models that reward kids for behaving appropriately. This is a basic expectation in life. I don’t get a prize for being polite as a teacher —- it’s a job expectation. Reward models give prizes for good behavior —- but the rewards soon become blasé. A ticket for a raffle isn’t enough of an incentive for good behavior – students want a pizza party, a movie day or lunch out with the principal. Students with IPPs may face fewer consequences for misbehaviors because they’ve got a diagnosis. Giving out certificates to students that model good behavior at a monthly assembly is OK – but not if it becomes an expectation that every student in the school deserves a certificate at some point during the year. In 2017 managing behaviors is harder than in 1978. There are fewer consequences for the children and less parental support. So – is teaching harder in 2017 than it was in 1978? In some ways no – technology has made it easier to plan and create units, create worksheets, and teachers have far more planning time, personal days, and lieu time. Technology has made it easier than ever to find and show videos of virtually any topic you can think up, to research and to learn new skills. Finale, Note Flight, Garage Band are programs that have made it really easy to create your own teaching materials. However, in many ways, teaching is a very different career than it was in 1978. It’s sometimes more about managing behaviors, differentiating instruction and trying to engage distracted students that about the actual delivery of instruction. Many young teachers are leaving the profession early in their careers. Among teachers who were new in 2007-8, 17 percent were not teaching five years later. Mentoring young teachers has been shown to help reduce the attrition rate. Support groups such as the Musicplay Teachers Group on Facebook are very helpful – you have hundreds of online mentors in one group. Making classroom tested lessons available to young teachers can be very helpful in their first years. I’ve had many comments from young teachers that having the Musicplay curriculum got them through their first years. Taking Orff or Kodaly Levels courses is invaluable. It’s hard to give up two weeks of your short summer break to attend classes, but the skills you’ll gain are well worth it. Attending Orff and Kodaly workshops is also invaluable for new and experienced teachers alike. Joanne Collins, who’s been a successful teacher for 55 years came to the Artie and Denise workshop last year and was one of our most enthusiastic participants! Don’t take the easy way out showing your students cartoon-like videos to teach concepts instead of teaching them in a way that involves them singing, moving, playing and listening. They may sit still and be engaged (behaving) for the moment – but is this feeding their addiction to instant rewards instead of teaching them to find satisfaction in a job well done? Use technology as a teaching tool — not a pacifier. Make music with your students – 40 years later, it’s still a really rewarding career and it’s a way to make a difference in the lives of the children you teach. This entry was posted in Uncategorized on March 26, 2017 by Denise Gagne. I wanted to wish you a merry Christmas and many blessings this new year! As another year closes I often reflect and I wanted you to know, that I have often thought of you through these years! Going to school was extremely hard on me in ________, with the non stop bullying, however I really feel your music class was the one happy place I had, where I felt I belonged…this was due to you! Your strength of character always was inspiring, and I still remember the day that I was pulled from band class to,have my hair inspected for lice because of some unkind remarks…but what I remember most is how you later went to my social class and let my class have it for being so unkind….you were the first person/peer at ________ school whoever stood up for me! It’s a kindness that I have always appreciated and taught me a great deal about the kind of person I wished to be! To be honest, this incident happened more than 20 years ago, and I don’t remember it as well as my student did, but I’m so glad that I helped, and that what I did was the right response for her. Last week, a friend who is a wonderful, involved, loving mother, lost her 13 year old daughter to depression. In my teaching career I lost a beautiful, talented grade 12 student to depression, brought on by bullying. I’m not an expert, but I’m trying to put some thoughts together with some ideas of what we as music teachers can do to prevent these terrible tragedies. Hand Holding: I have a video of a preschool class making a circle, where one child didn’t want to hold the hands of the child next to them. Yes, this starts in preschool. In this class, I stopped them and said, “It’s really nice to hold hands in the circle with anyone who asks you. It isn’t nice when we’re making a circle in music class to say no.” Sometimes, I position myself, to hold hands with the child that may be rejected by the other children. 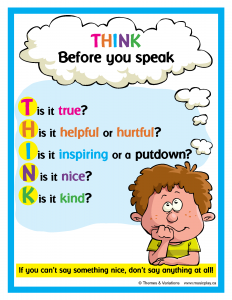 Mean Comments: Sometimes you’ll hear a child say something about another student that is mean. I was unhappy about things that I heard my older grandson saying about his younger brother. I made this poster and it’s on the fridge in their house. I’ve told them, that they’re going to have to make a copy of it if I hear mean comments. Joanie C wrote to add another suggestion: Another thing I do is when we are doing mixer dances, before we start I let the kids know that everyone has to have a partner, and no one can say “no” to someone who asks them to dance. Additionally, I let them know that for every refrain where we are choosing partners, everyone will be choosing new partners each time. So there are no friends that are forever together and excluding others, there are no bullies who are saying “don’t dance with him/her”, and the opposite, if someone is dancing with a student they don’t feel comfortable with, it is only for one refrain and then they will move on to others. These are the rules, no exceptions, and I always end up seeing kids who supposedly don’t get along with each other dancing and laughing together. Sometimes breaking down the bullying has to be very directed! The following suggestions are adapted from https://blog.ed.gov/2012/04/top-5-ways-educators-can-stop-bullies/ with my additional comments. Establish a culture of inclusion and respect that welcomes all students. . Set a tone of respect in the classroom. The three specific suggestions above all will contribute to providing a safe, supportive environment in your music room. 2. Manage Classrooms to Prevent Bullying. Develop rules with students so they set their own climate of respect and responsibility, and reinforce the rules by making expectations clear and keeping requests simple, direct and specific. 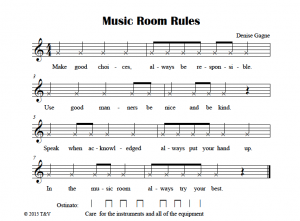 I love my Music Room Rules Posters that lay out the expectations clearly, in a musical way, and that make such a great lesson and bulletin board. Make good choices, always be responsible. 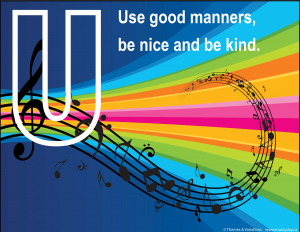 Use good manners, be nice and be kind. 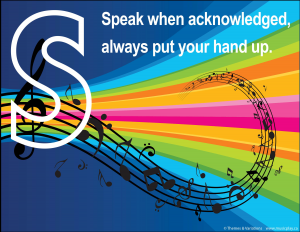 Speak when acknowledged, always put your hand up. 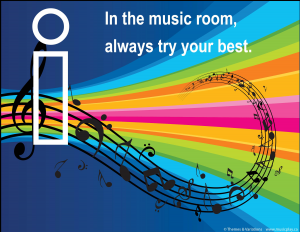 In the music room, always try your best. 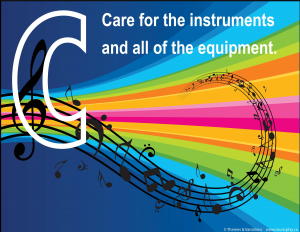 Care for the instruments and all of the equipment. 1. Have the students read the rhythms. 2. Read the words in rhythm. 4. Give the students a suggested body percussion to go with the first line. 5. Read the second line and have students each create a body percussion pattern for it. Keep a beat on a woodblock or a drum and have them do the line four times, working out a body percussion. Divide the class in half and have one have perform and the other half of the class watch. The watchers should choose several performances that they like. As a class choose one body percussion pattern to use for the second line. Switch roles for the third and fourth lines. 6. Choose instruments to play the ostinato. – ostinato continues while chant is performed 2x – end with the ostinato 2x dim. 3. Stop Bullying on the Spot. Intervene immediately. It’s OK to get another adult to help. Don’t talk to the kids involved together, only separately, and don’t make the kids involved apologize or patch up relations on the spot. In instances of bullying, don’t make the victim feel victimized again, by using peer mediation. 4. Find Out What Happened. Get the facts, keep all the children involved separate, listen without blaming and don’t call the act “bullying” while you are trying to understand what happened. Finding out what happened can be really difficult. I had an incident in a middle school band class. It happened while my back was turned, and although I was 99.9% certain who had assaulted the student, I didn’t see it, and the other students wouldn’t talk. The principal wouldn’t follow through. I felt he should have got some of the other kids in the class alone in his office and asked them directly – I figured they’d cave and give up the name of the bully. He didn’t take the time to do this. In the end, all I could do was watch the bully really closely in my classes until the end of the school year. It never happened again, but I felt very frustrated that the the student who’d physically hurt another child got away with it. 5. Support the Kids Involved. All kids involved in bullying—whether they are bullied, bully others, or see bullying—can be affected. It is important to support all kids involved to make sure the bullying doesn’t continue and effects can be minimized. Every child has the right to be respected, included and feel safe in school. As music teachers, who often teach every child in the school, we are in a unique place to promote inclusion of all and create a safe and supportive environment for students. Artie and Denise Summer Symposium – July 25-26, 2017 in Las Vegas! This is the 8th annual – and we’ll be joined by Thom Borden, for an amazing 2 days of workshops! This entry was posted in Classroom Management, Teaching Tips, Uncategorized on March 14, 2017 by Denise Gagne. Denise Gagne on St. Patrick’s Day Unit – Lesson Ideas for St. Patrick’s Day!